A fine video game company founded by Mike Robinson. Very silly things are in the works. For updates follow @mike_robbo on twitter. KRIZL – Crosswords with a twist is out now on iPhone, iPad, Android & PlayBook! Here’s a selection of Games I’ve created with the help of the Zombie gang for concept & visuals. The worlds first potato simulator! Generate your own taxidermy wonders! Here’s a selection of websites I’ve created with the help of the Zombie gang for concept & visuals. 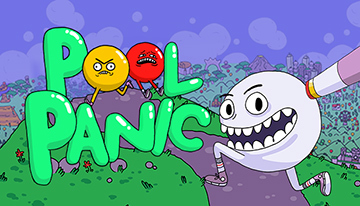 We are excited to announce Pool Panic! Coming Soon to Nintendo Switch and Steam from Adult Swim Games. Have you ever wanted to inhabit the brain of a clueless cueball as it traverses a strange world? Well now’s your chance in over 100 levels single player! Or you can challenge your friends to bizzare party play in 2 to 4 player local multiplayer. Get holding your breath because it’s coming! (Don’t actually hold your breath). Keep an eye for the new Crossword Twisty game coming to iOS and Android! IE9 came out of beta yesterday and so I checked it out to see if the release candidate had sorted out globalCompositeOperation which could only handle source-over in beta. Read up on the sub physics.